Remove the cruft of years with a clean install of OS X.
I am a man of many Macs and have been for some time. When you use a platform over a long period of time, you’re bound to run into some problems. Enter my 2009 MacBook Pro. This hardy workhorse was my main machine for years. I upgraded the internal drive to a 250GB SSD and maxed the RAM out at 8GB. Even so, a Core 2 Duo doesn’t compare to an i5, even at a slower clock speed, so I eventually bought a MacBook Air with half the drive space and half the RAM. Now the two machines split duties. While I go about my daily work and play on my Air, the Pro sits in my home office, hosting my definitive iTunes and Photos libraries, my ancient emails, and any old files I still sometimes want access to. Up until last week, my user account on the MacBook Pro was one that had been migrated forward through OS X upgrades and Migration Assistant since moving from OS revision to OS revision and machine to machine since—and I can’t believe I’m writing this—2003. 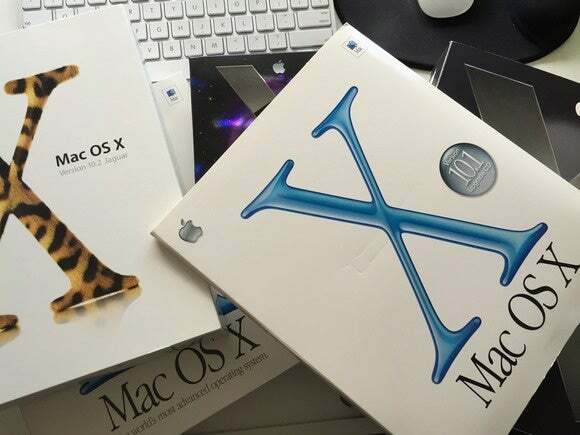 That means this account has existed since I was using Mac OS X 10.3 Panther on a PowerPC machine (I tried earlier versions of OS X but probably still mostly used OS 9 until about then). 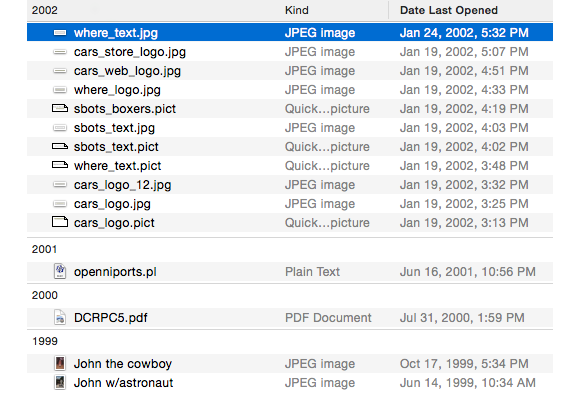 Look at how old these files are! Running the OS X upgrade process (as opposed to doing clean installs) and using Migration Assistant to move accounts to new machines both have worked fairly well for me. But over a period of 12 years, some unwanted baggage can accumulate, and that user account you rely on can get a little temperamental. How does a computer with a more than a decade-old user account express its temperament? It’s slow. It lets you rename the computer in the Sharing Preferences pane but doesn’t change the name in the Terminal. It refuses to let you connect via screen sharing. It takes two tries to reboot it. It’s generally just surly and difficult. Enough was enough. It was time to start over with a fresh install. This wasn’t going to be easy, though. As I said, this account had several media libraries, was where I synced music to my Sonos from, had Mailboxes with mail in them dating back to 2001, was our Minecraft server and had a mess of old games and documents I still wanted. I couldn’t just trash everything. The first move, obviously, was to back up. So I backed up three times in three different ways. Really. I normally keep two backups of my important drives, a daily one in Time Machine and a weekly one via SuperDuper. Why both? Time Machine can be fickle and a SuperDuper backup provides a complete, bootable disk image in case a drive goes south on you (sometimes a drive just takes off to Mexico) and you need to run OS X off it in an emergency. The third backup was just a straight copy of files from my Documents folder, my iTunes and Photos libraries, those mailboxes, and a few other things I didn’t want to lose. I probably didn’t need this, but hey, I’ve got drives and when you’re blowing up a user account with all your important crap, it’s not the time to be stingy. Everything backed up, it was time to reformat the drive. That proved easier said than done. I had saved the Yosemite install application when I first upgraded to 10.10 (if you don’t have it, you can download an updated version from the Mac App Store) so I copied it straight to the Applications folder on the drive I wanted to reformat and ran it. It rebooted and started the Yosemite install process, but it never gave me the option to format the drive. When the process was done, I found I had the same user account, just running 10.10 instead of 10.10.4. That… was not what I wanted at all. I had thought you could reformat the drive via that process but apparently it’s not an option when you’re running the install from the drive you’re installing to. Now to put my data back. Remember, I was starting over. Migration Assistant had been bringing forward some amount of unidentifiable cruft dating back to 2003 that I was trying to get rid of, so using it was not only not an option, not using it was the whole point. I needed to copy things back in old school. When you have enough backups, weird error messages like this aren’t a cause for (much) concern. Documents, my iTunes library, and the Mail mailboxes copied back from the drag-and-drop copies I made with no problems. The Photos library, however, failed to copy back saying “some data in Photos Library could not be read or written.” Ah, yes. Probably all of my ineffable photos. Understandable. They do have a certain je ne sais quoi about them. Well, this is why I made three copies. The copy from the SuperDuper backup worked fine. After importing the Mailboxes to Mail, I pointed iTunes and Photos to the correct libraries. In iTunes you can change this through Preferences or by holding down Option when starting the application. In Photos the only way to do it is by holding down Option. I noticed both applications have different prompts for selecting a library at startup because the person in charge of consistency at Apple was off that day. I also had to reinstall Java for the Minecraft server, but I left Flash behind (it’s long gone from my MacBook Air). I refrained from installing any of the dozens of third-party applications that had been on the machine previously. In its role as a data host, it probably won’t need them. My Mac works better, and I saved a lot of space. Now I had a fresh install of Yosemite with all of my ancient data but without whatever Bush-era settings were causing problems. I wouldn’t say it’s exactly like getting a brand-new machine, but it’s at least a major improvement. Because I left a host of applications behind, I have far more drive space. Things behave better almost across the board. It’s faster, happily lets me screen share, reboots without any trouble, and has its own new name instead of the one I migrated that it didn’t want to change. While this process takes some time, I recommend it if you’ve used Migration Assistant and OS X upgrades over existing installs for years and have a Mac that’s giving you fits.